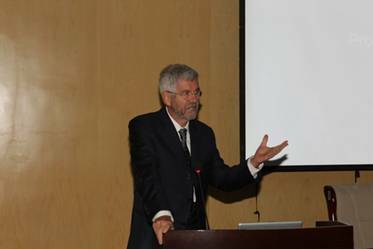 At the invitation of Professor WU Ji, Director General of NSSC, Professor Giovanni Bignami, COSPAR President, visited NSSC, delivered a talk and attended the Closing Ceremony of COSPAR Capacity Building Workshop on Remote Sensing of the Global Water Circulation to Climate Change on Sept 14. Professor Bignami delivered a talk on The Committee on Space Research (COSPAR) Fifty Years of Service as a Platform for International Cooperation to all the students of this workshop and there were more than 70 audiences from NSSC. During the talk, Professor Bignami touched upon the history of COSPAR and elaborated on the COSPAR Capacity Building workshop activities. Professor Bignami also attended the Closing Ceremony of this COSPAR Capacity Building Workshop and congratulated NSSC for organizing such a successful workshop. In the end, Professor Bignami and Prof. Ji Wu delivered the diplomas to the students.